I decided to take a longer look at the company’s historical profitability before deciding whether to add to the position, as I am always focused on downside risk. I started the position small at around 2% due to being uncertain about how 2017 would play out, so with an extra year of data, it was time to decide whether to make it a full size position. The main benefit to UCG over a standard carpet retailer is their franchise model. This means that they do not have many of the large overheads that companies like Carpetright (CPR.L) have, which have caused them to struggle to turn a profit. 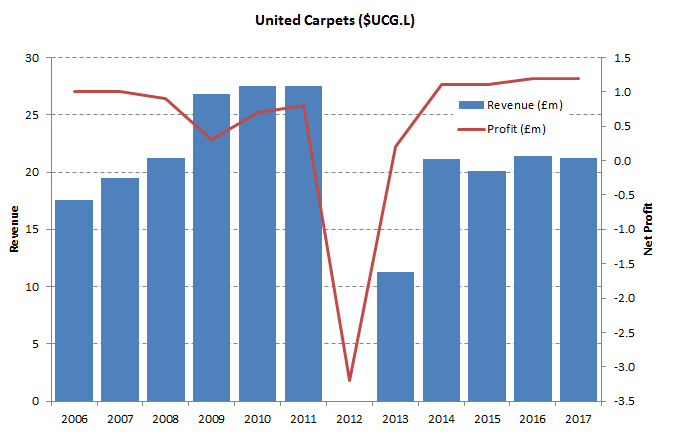 By contrast, United Carpets has 7% operating margins and return on capital of around 30%. The one good consequence of having had a recession 10 years ago is that we can see how companies fared under extreme circumstances. The chart below shows revenues and profits for UCG over the last 11 years. I am showing net profit as historically this seems to be a good indicator of the free cash flow. We can see that the recession hit this sector rather late, with just a single loss making year in 2012. Note that the company underwent a large restructure in 2012 and did not accrue any revenue, and then only half a year in 2013 (on which is still made a small profit). During this time, the number of franchise stores was reduced and those with high unaffordable rents were closed. This has led to much more stable revenues and profits since, despite some competitors having difficult trading years in this period. In the 2006 to 2011 period, UCG earned an average of £800k profit per year. Post restructure, it has consistently earned over £1.1m. It is clearly not a growth stock and the market seems to be rather bored by it. But with a dividend yield of 5% and earnings yield of 23%, I think it’s a good deal. And on a speculative note, in May 2017, the company announced a 1p per share special dividend (current share price 8p). Due to its strong cash generation, it will soon have similar levels of net cash so there could be another windfall coming. I am positive on this company and have a lot of confidence in its management. Peter Cowgill, the chairman, has done wonders with both this company and JD Sports. So I have doubled the position size to 3.5% of my portfolio. I should note that the bid/ask spread shown for this share is legit (often the ones quoted on websites aren’t actually real and you can achieve better spreads through your broker). As it is real, you will be losing 6% just in the spread. Also during the 2012 restructuring, the company did not file accounts and hence was suspended from AIM until it was in a position to do so. This was deliberate and nothing dodgy, but there is a liquidity risk with this share. Looks like a very interesting case. Thank you for sharing. I have added your site to my bookmarks. However, I have one concern with this company: The directors are (very) well paid. They own ~65 % of the company – hereof the CEO owns 45% (great to have so much skin in the game). They have a gross profit of around 12 mio. GBP and 6 directors/executives are paid ~1 mGBP in total (~5% of sales) which is A LOT considering the company only makes around 1,5 mGBP in operating profit a year… It seems like they use the company as a piggy bank more or less. They could pay themselves less and explode the profit margin/dividend and with this the share price as well benefitting them selves and the minority shareholders. For more info on remuneration look at page 14 in the AR 2017. What is your view on their outstanding lease obligations? They are very high and growing. I find this strange given that they are a franchiser. Operational leverage is understated in their financials. Franchisees will continue to pay and be profitable untill they go belly up. I’m not too comfortable at how the long dated lease obligations grew from 2016 to 2017, but they seem to lease properties and then sub-lease to franchisees. I’m not sure why but it does expose them to some risk, but I’m not too bothered by it as it only becomes a problem when the franchisee shuts down. If that starts happening on a large scale then the company is in trouble in a lot of ways, but could at least try to sublease the properties to other companies.